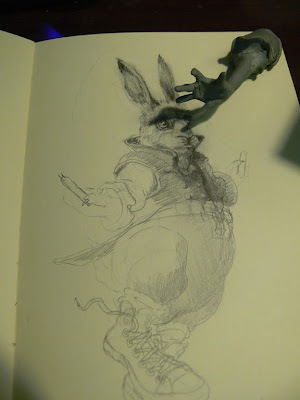 Woke up this morning with this image of a rabbit jumping rope. Probably just a message from my subconscious that I should exercise. Figured exercising my hand,head,and eye was a worthy substitute. 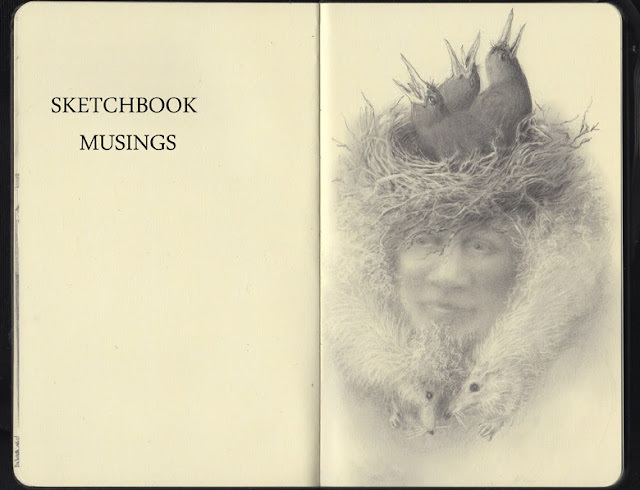 Usually when I work in my sketchbook I geek out on some TED or FORA lecture in an attempt to nurture my intellect with some form of noble knowledge. Ya know genetic engineering, evolution, religion, or some form of aesthetic or intellectual history.Stuff like that. Frequently I pepper this food for thought with a little Louis Black, Doomsday Prepping and a pinch of permaculture (Just to keep me grounded). Topics without pictures are preferred because then I actually pay attention to drawing! 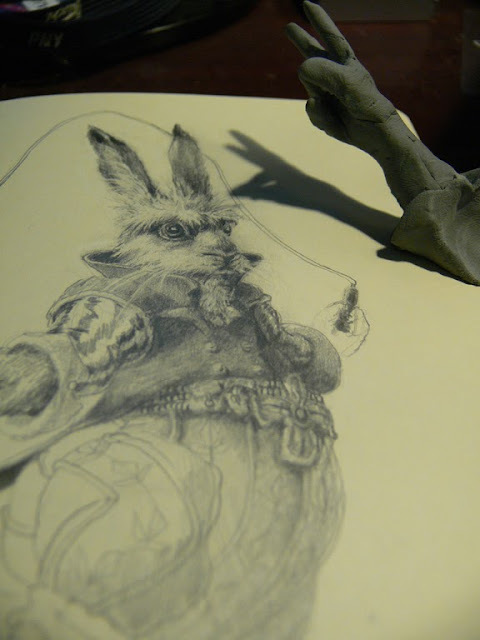 Albrecht Durer was on the Youtube menu today so I ended up being distracted by the visuals. Durer will forever be connected in my brain to rabbits and of course, the apocalypse. 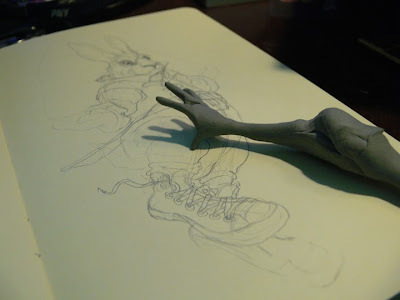 Well the visuals were gorgeous in this video series by the BBC, therefore I ended up unconsciously playing with my kneaded eraser (which I sometimes use as a reference or a shadow puppet:)). Here is the link to the series! 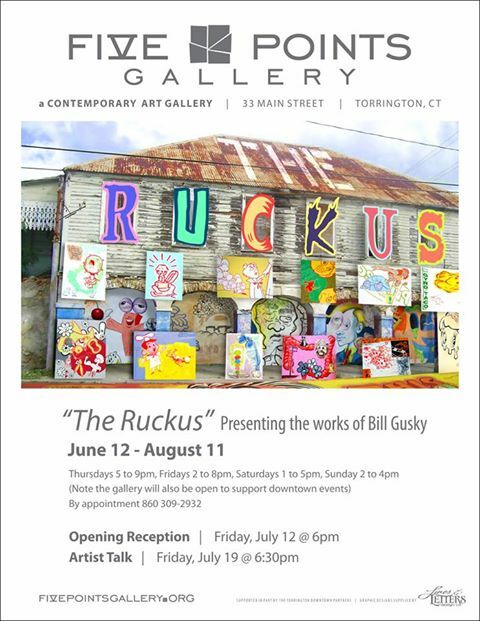 Bill Gusky at Five Points Gallery Today!!!!! This is my anti-meditation, a ransacking of many sources, the outflow of incessant inner dialogs and irresolvable inner conflicts. Contradictory statements are piled on and torn away. Messages are added and obliterated. Gestures meander through crudeness and refinement. 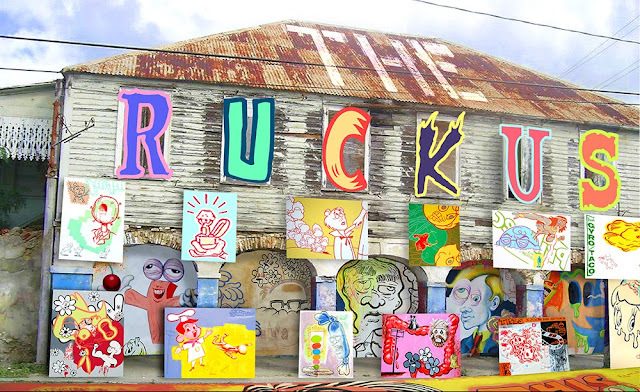 I bring the ruckus to these arguments with myself that never really end, but are merely carried forward through different materials and formats. 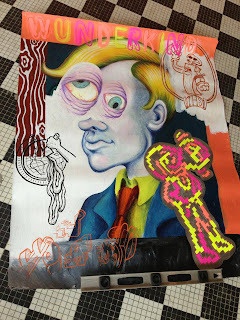 Working across unrelated styles and subject matter gives me a much better chance of making art that’s awkward, discordant, and seemingly belongs nowhere. For the moment that seems to make a lot of sense. Twin Berlin at Meadows this Afternoon:)! AWESOME FRIENDS UPDATE! Twin Berlin at Meadows this Afternoon:)! Ya Still Have Time to Get There!! Alex Alves, one of our Awesome Friends ,whipped up a midnight batch of stunning shirts at his Shirt Bakery for Twin Berlin last night. Here's the prototype! 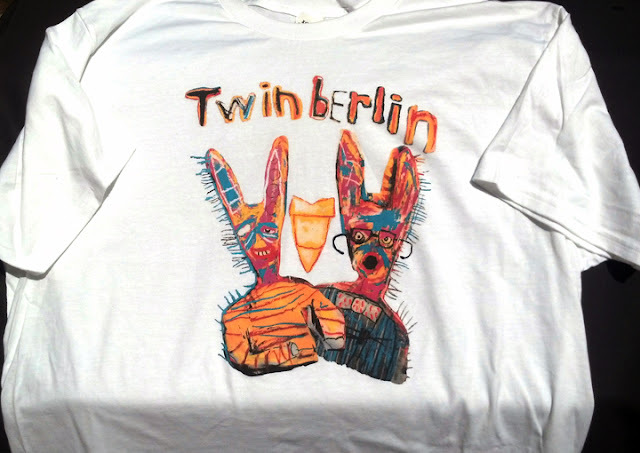 The shirt features elements of Twin Berlin's album cover designed by Mikey Welsh. Twin Berlin's guitarist Matt Lopez is the lucky owner of this luscious urban tribal work! 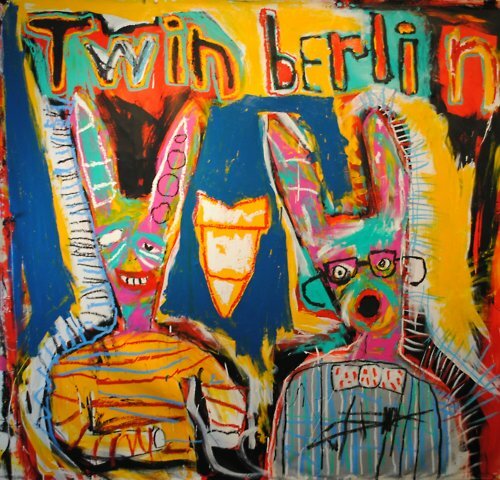 Mikey Welsh, the former bassist from Weezer was an exceptional painter and was developing his art career before his tragic departure from this world. Twin Berlin is playing today at the Rockstar Uproar Festival at the Meadows in Hartford today. Featured at today's festival are Alice in Chains, Jane's Addiction, Coheed and Cambria and Circa Survive!! Twin Berlin has been invited to do a set on the Festival Stage at 2:30 today!!! Get tickets here and go!